Close-up of the dial of my vintage Omega Seamaster. As you can see here this dial is a so-called redial, a replacement of the original one which was too damaged (probably as corroded as the hands). 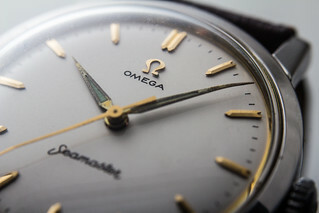 But the redial is not of great quality, as the applied Omega logo shows here.